Commensalism is a relationship between two organisms in which one organism benefits, and one is unaffected. This can be contrasted with other types of symbiosis, such as mutualism and parasitism. The supposed difference between commensalism and other types of symbiosis is that in commensalism, the second party or host remains unaffected. Some scientist argue that this is likely improbable, and that most commensalism will be found to be mutualism or parasitism once the effects on the host can be appropriately studied. Other scientists argue that commensalism does exist when the effect on the host is imperceptible. Many cases of supposed commensalism exist in the natural world. The benefits to be gained in a commensal relationship can be transportation, nutrition, protection, or a variety of other benefits. Many hosts of commensal organisms appear to be unaffected, at most being slightly bothered by the presence of the commensal species. An interesting example of commensalism is that of the pseudoscorpion. Pseudoscorpions are very tiny scorpions (less than a centimeter) that hitch rides on much larger insects. 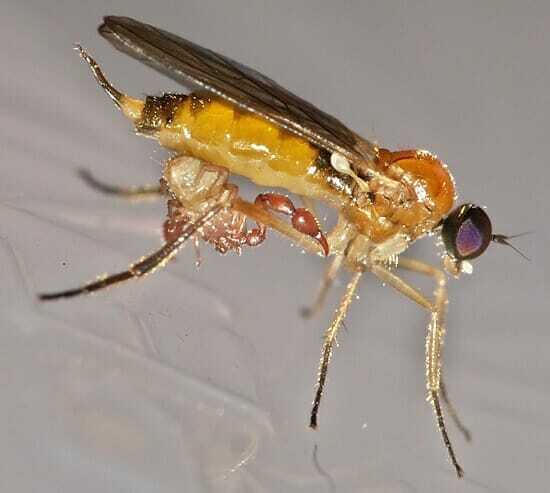 Seen in the photo above, a pseudoscorpion is attached to the leg of a much larger fly. The pseudoscorpion does not have a stinger like a traditional scorpion, and does not kill the larger insect it hitches a ride on. Oftentimes, it will simply hitch a ride from one place to another. In this case, the fly is only inconvenienced in a minor way. Once the pseudoscorpion has hitched a ride, the relationship is over. However, if too many pseudoscorpions tried to hitch a ride at once, the fly would be overwhelmed or would spend too much energy flying and the relationship would become parasitic. Many organisms tread a thin line between a symbioses of commensalism versus one of parasitism, and often the distinction is hard to tell. Small bait fish and manta rays often show a form of commensalism in which the baitfish are protected simply by their proximity to the larger fish. Large manta rays will often be seen with huge schools of small fish underneath their enormous fins. It is believed that the small fish are protected from birds that would otherwise dive in and eat them. At the same time, the manta ray is completely unaffected by the baitfish, and may not even notice their presence. Most large marine animals have some if not many smaller animals following or attached to them. In some cases the animals are parasitic, as in the case of lampreys, which feed on their host. Many cases of commensalism exist as well, where the host is unaffected. Some of these include fish that follow sharks and feed on the left-overs of their kills. Others include small barnacles that attach to whales, as long as the barnacles do not hurt the whale. Again, a certain level of commensalism is tolerated with no harm, but eventually the situation can become parasitic. Many plants have developed strange ways to distribute their seeds to new environments. One very successful way is to be sticky, barbed, or hooked. 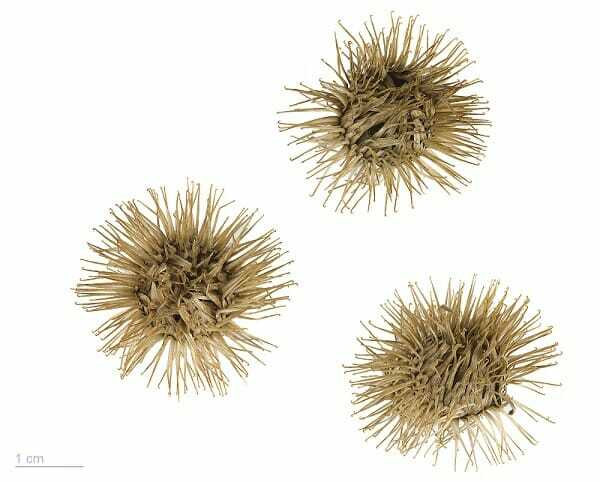 In fact, velcro was originally designed after scientists studied the seeds of noxious weeds that would stick to pants. If you’ve ever walked through a natural grassland, you know that on the other side your pants will be covered with a variety of sticky seeds. The seeds eventually fall off, and do you no harm. Therefore, much like the pseudoscorpion, the seeds are hitching a ride on another species. The host hardly notices the hitch hiker, and continues along in peace. Eventually, the seeds get rubbed off and have a chance to establish themselves in a new environment. Symbiosis – A close and lasting relationship between two different species. Mutualism – A type of symbiosis in which both species benefit. Parasitism – A type of symbiosis in which only one species benefits. 1. A new species of bacteria is found that lives inside of your gut. The bacteria lives off of waste that you would excrete anyway, and the heat you produce. It does not seem to give you any benefit in return. How would you classify this symbiotic relationship? C is correct. Since the bacteria does not affect you in any way, and it receives much benefit from riding around in your gut, this symbiosis is an example of commensalism. If the bacteria produced a product your body could use, it would be mutualism. If the bacteria used your body to reproduce, but destroyed it in the process, it would be parasitism. 2. Anemonefish, or “clownfish”, are certain species of fish that live inside of anemones. Unlike all other fish, they are protected from the stings of the anemone’s tentacles. The anemonefish uses the anemone for protection and feeds off of the scraps the anemone leaves behind. Sometimes, the anemone gets parasites that the anemonefish can pick off, and the anemonefish chases away fish that like to eat anemones. How would you classify their symbiosis? C is correct. Because both parties receive added benefits, the relationship is mutualistic. In fact, in each of the 30 known species of anemonefish, the fish can only live in one species of anemone. This suggests that the species pairs have been evolving together for a very long time as evolutionary buddies. 3. The striped cuckoo is a bird native to South America. Instead of raising its own young, the striped cuckoo lays its eggs in the nest of other birds. The unknowing parent of the nest then raise the chick as their own. Often these chicks consume more resources than the genetic offspring, and sometimes kick them out of the nest or kill them. How would you classify their symbiosis? A is correct. The cuckoo chicks, consuming more resources and hurting the other chicks, damage the reproductive capabilities of the host birds. In this way the cuckoo gets all the benefits and the host birds suffer a considerable loss. If the cuckoo chicks were smaller, and would share with the other birds, the relationship might be considered commensalism.